The vicar is very proud to be able to bless the new two manual pipe organ that has only just been installed in St. Hilary's church. The children are very excited because they remember how hard it was for them to raise all of the money to buy it. 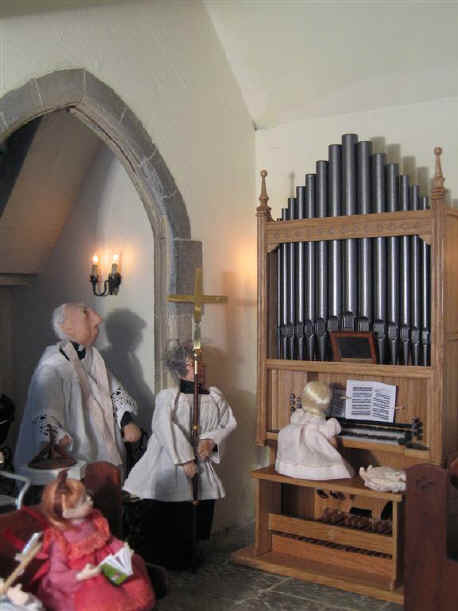 The vicar is to bless the new organ for use in St. Hilary's before it is played for the very first time by Pheobe in its very first service in St. Hilary's! Find out below how the service went and what went wrong too! 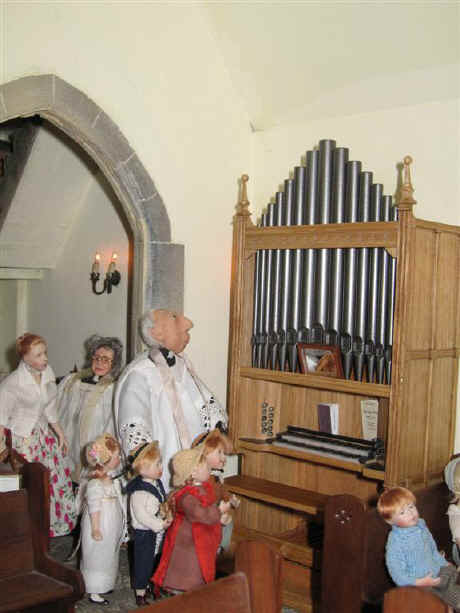 The vicar asks the congregation and children to gather around the new pipe organ as he blesses it for God's service in St. Hilary's. 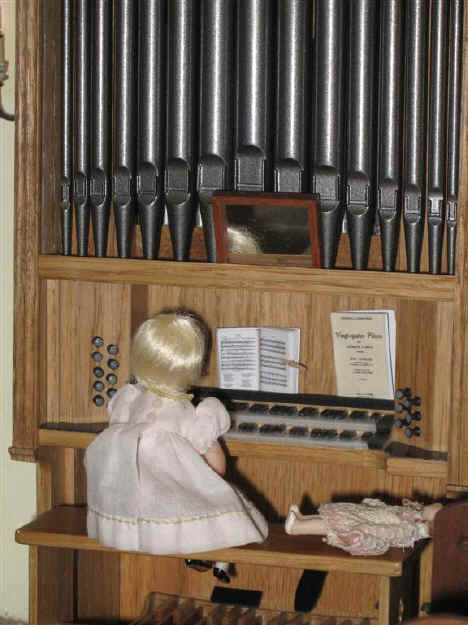 Phoebe has offered to play the new organ for this very first service with the organ. She is very nervous but her dolly helps comfort her as she prepares to play a piece of music before the beginning of the service. Can you see that she is not tall enough yet to reach and play the foot pedals? However that does not matter because many composers have written music for the church organ that does not need the foot pedals to be played. Have you noticed something strange? How is Phoebe keeping the music open at the right page? She has brought some wooden clothes pegs from home and they are just perfect for the job! We hope she doesn't lose one if it falls off! The Rev Ken is carrying the cross today and he is almost ready for the opening processional hymn! Oh dear Phoebe - we hope she remembers to swap her music for the hymn book so she is ready to play the first hymn. Oh dear! Everyone can hear one note sounding REALLY loud all of the time! 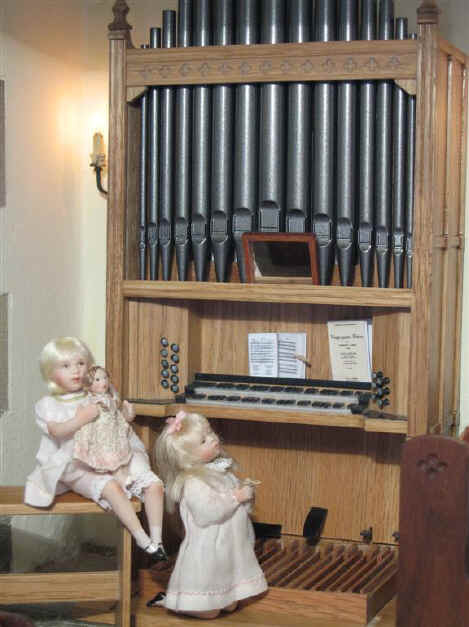 Everyone is wondering what is causing the problem with the new organ. Surely it was TOO new to go wrong so soon they all thought. Priscilla Jane was not very far away. She noticed that something was not quite right with the music. Can you see what it is? Yes - one of the clothes pegs is missing! Priscilla Jane climbs into the space with the foot pedals and hunts for the missing clothes peg. As she picks it up the loud long note suddenly stops! How clever she was to work that one out wasn't she? 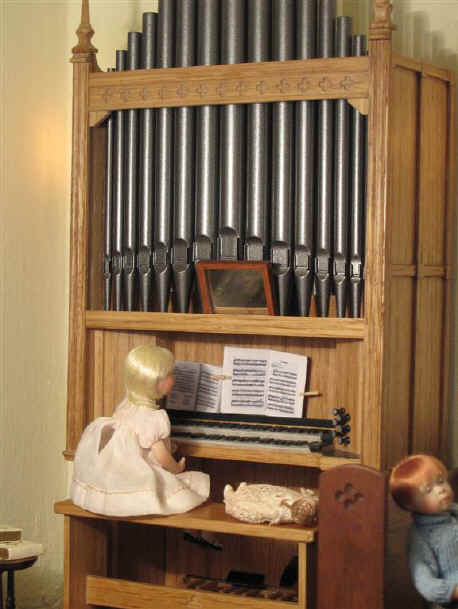 Phoebe has not been practising for very long on the new organ and she had accidentally pulled a foot pedal stop out. The organ stops make the pipes sound when the pedals or keyboard is played. The peg had fallen off the music stand and was stuck between two pedals making one pipe suddenly sound. Well done Priscilla Jane for noticing the problem so quickly after the first hymn had been played. Poor Phoebe, however, looks pretty upset and has had to clutch her dolly for comfort. It is good that she remembered to bring her dolly to church isn't it? Many thanks to Lorna Webb for providing us the clothes peg story. The original story is quite true and we were happy to adapt it for our organ blessing page.